The 12 finalists for the title of 2015 Oklahoma Teacher of the Year were announced last week at Vision 2020 during the Wednesday general session by State Superintendent of Public Instruction Janet Barresi. 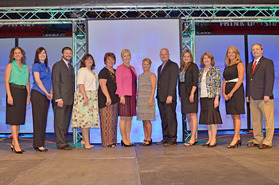 A panel of Oklahoma educators selected two finalists from each of six regions of the state. Each finalist is a current teacher of the year in his or her school district. Cynthia Brown, who teaches AP English Language and Composition and Humanities at Piedmont High School. Roger Clement, who teaches Physical Science, Biology, Chemistry and Chemistry II at Noble High School. Adam Forester, who teaches Chemistry, Pre-AP Chemistry, AP Chemistry and Earth Science at Bethany High School. Monica Hodgden, who teaches Pre-Kindergarten at Woodward Early Childhood Center. James LeGrand, who teaches AP U.S. History, “America in the 1960s” and “Civil War and Reconstruction” at Altus High School. Romney Nesbitt, who teaches art at Jenks West Intermediate School. Jason Scott Proctor, who teaches Geometry, Algebra II, Pre-Calculus and AP Calculus at Tahlequah High School. Diane Walker, who teaches All-Honors Oklahoma History, World History, Government and Geography at Muskogee High School. The next Oklahoma Teacher of the Year will be announced during a ceremony at the Oklahoma State Fair, Sept. 16 in Oklahoma City. Individual fact sheets about all the candidates and their approaches to teaching are available on the OSDE website, along with more information about the program. For more, visit: http://www.ok.gov/sde/2015-oklahoma-teacher-year-finalists. 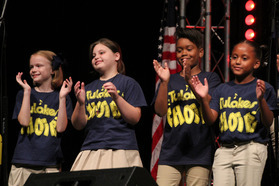 More than 5,000 Oklahoma educators attended this year's Vision 2020 conference. Lee Roland, principal of Tulakes Elementary in Putnam City Schools, gave the first keynote, reflecting on how great teachers are today and offering a call to action. A video of his presentation is currently being prepared and will soon be posted to the Oklahoma State Department of Education's Vimeo page at vimeo.com/oksde. Paul Tough spoke about the importance of character Wednesday, and Scott Barry Kaufman said it's time to redefine intelligence in his keynote Thursday. Breakout sessions covered hundreds of subjects on all three days. For an overview of what people saw, search for #OKVision2020 on Twitter. Although the conference is over, you can still download valuable materials. Many of the presentations used in breakout sessions are available at okvision2020.ok.gov/events. Click on the time slot and then the title of the session you're interested in to find any materials. Materials are also available through the Vision 2020 app for Android or iPhone. Search for "Vision 2020" in your app store. It's free and still available. While you're at it, take a look at some of our photos from Vision 2020 here. A free online resource aimed at strengthening American Indian education in Oklahoma is now available to all educators. Located on the Oklahoma State Department of Education (OSDE) website at ok.gov/sde/oier, the Oklahoma Indian Education Resource (OIER) details the vibrant culture, traditions, history and governments of the state’s 39 sovereign tribes. The resource site provides information on the tribes of Oklahoma to assist teachers as they prepare lessons on the state’s indigenous history and cultures. Topics range from Native American contemporary arts to Native American Code Talkers of World Wars I and II. The instruction material on the site is aligned with the Oklahoma Academic Standards for Social Studies. There are plans to implement a wide spectrum of lesson plans appropriate for all grade levels and in all subjects, including math, language arts and science. Teachers are encouraged to submit their own lesson plans for inclusion on the website. Her sentiments were echoed by Dwight Pickering, director of the Office of American Indian Education at the OSDE. In developing the resource site, the Office of American Indian Education at OSDE worked closely with American Indian educators and with the support of the 39 tribes in Oklahoma. Other partners in the project include: the Oklahoma Historical Society, OETA, the American Indian Cultural Center and Museum, The Oklahoman and the Oklahoma Council for Indian Education. As the state boasts one of the largest American Indian student populations in the nation, the resource website promotes the multiplicity of the 39 tribes by incorporating and integrating curriculum and lesson plans of each nation. The Oklahoma State Department of Education (OSDE) has released to school districts initial state aid allocations for Fiscal Year 2015. Districts will see an increase in per-pupil funding of $38.60 per student. The initial allocation for FY15 is $3,077.20 per student as compared to the $3,038.60 received as the initial allocation in FY14. The state appropriation to schools for the funding formula during the new fiscal year, after the adjustment pursuant to the state Attorney General’s opinion 2014-7, is $1,876,284,000. Factoring in projected costs for new and “virtual” charter schools, the initial allocation to districts for FY15 is $1,809,293,678. Gov. Fallin and state lawmakers this past legislative session provided a total of $80 million in additional funding for K-12 public education. While significantly less than what OSDE had requested in light of escalating healthcare costs and a growing student population, the amount was the largest increase given to a state agency this year. The Oklahoma State Department of Education is seeking applications from people who want to be highly engaged in writing new academic standards for English language arts and mathematics. Dates and details may change, but the need for input from as many great, local educators as possible is a must. With a vote taken by the State Board of Education at its July 23 meeting, there is no more uncertainty of what standards to teach for the next two school years. PASS standards are the current state standards in math and English Language Arts. The State Board of Education today awarded more than $5.3 million in competitive grants to 16 applicants for use during the 2014-2015 school year. The purpose of the competitive grant is to provide funding to programs and services that support the Oklahoma State Department of Education’s (OSDE) goal of ensuring that all children graduating from an Oklahoma high school will be college, career and citizen ready by the year 2020. View the recipients and their awards by clicking here. Elementary children are invited to receive a free dental screening during the Oklahoma Dental Association’s second annual Back to School with a Healthy Smile event, Sept. 8-12. With a simple dental screening parents will learn about their child’s oral health before serious problems arise. Poor oral health in children can lead to a failure to thrive in school, just like vision or hearing problems. This failure can be caused by the inability to concentrate and learn because of pain and possible infections that can lead to misbehavior, school absences and severe systemic illnesses. To find a participating dentist in your area, visit www.okda.org or call 800-876-8890. OK teachers can win supply spree as voters show "thanks"
Farmers Insurance is giving away $1,000,000 to teachers in $2,500 school supplies shopping sprees as part of its “Thank a Million Teachers” campaign. Teachers can participate two ways—by submitting a proposal on how to use the money or by supporting each other by voting for proposals online. Teachers can go to thankamillionteachers.com and submit a paragraph proposal on how they want to use the money. Each teacher then gets people to vote for the proposal during the voting round. Anyone can vote for as many proposals as they want, once per day. There’s a new round of voting about every two months. The next round is in September. Proposals will be accepted until the end of August and voting will take place all of September. Awards are distributed through six regions of the country. Oklahomans compete with teachers from Texas and Missouri, which are larger states, but Oklahoma uniquely boasts a local Farmers workforce of more than 1,500 people. Two state teachers have already won in previous rounds. Go to thankamillionteachers.com. Scroll down and select the red "Vote for a Proposal” button. Select the state of OK.
Hit the VOTE button on the proposal you feel is best. Watch your email and click the verify your vote button for your vote to count. How could you use $2,500 of school supplies? Galleria Furniture, a furniture store in Oklahoma City, is gearing up to collect supplies for classrooms in rural parts of the state. The “Flip Flop – Hip Hop – Hoop It Up for Education” School Supply Campaign will take place Aug. 1-9. Anyone dropping off school supplies will receive a ticket to be used at the grand finale event on Aug. 9, granting the ticketholder an opportunity to try and “Crack the Vault” for a $10,000 Galleria Shopping Spree and a $5,000 cash donation to one of the rural schools named by the campaign. There will be hourly drawings, activities for the kids, special guest appearances, basketball competitions, flip flop giveaways, live entertainment, refreshments and much more throughout the day. Bring your lawn chair and plan to spend the day at Galleria Furniture. Corporate sponsors are also welcome. Galleria Furniture is located at 3700 W I-40 Service Rd. Registration is about to open up for the 2014 Verizon Innovative App Challenge, which calls on middle and high school students with faculty advisors to develop mobile apps that address a problem or need in their communities. Each winning middle school and high school will receive a $20,000 grant from Verizon and each student on a winning team will receive a Samsung Galaxy Tab, among other awards. Students work in teams of five to seven people with faculty advisors to develop an original concept for a mobile app that incorporates STEM principles and content and addresses a real need or problem in their school or community. While designing their apps, students consider marketplace need, usefulness, audience and viability. In recent years, staff and administrators from K-12, career tech and higher education have become keenly aware of the need for emergency preparation. In the wake of everything from school shootings to natural disasters, school safety has moved to the forefront of responsibilities for today’s administrators but they have not always known where to go for help and training in this area. In the state of Oklahoma, Moore Norman Technology Center (MNTC) has become a growing source of emergency management information and training. One of 29 technology centers in Oklahoma’s highly respected CareerTech system, MNTC has taken the lead in bringing emergency management training to the state’s educational institutions. Jerry McConnell, director of facility operations for MNTC, began sharing his knowledge and skill with individual schools in 2008. Certified in active shooter and intruder training among other things, word of McConnell’s expertise has spread over the years and allowed him to expand his offerings to include hazard vulnerability and threat assessment, emergency planning, safety team implementation, severe weather preparation and more. In the past two years, McConnell has facilitated or coordinated over 30 training sessions—including roughly 11 for public schools— for facilities managers, safety officials and administrators representing Oklahoma public schools, technology centers, higher education, police, emergency management and the weather industry. Topics have ranged from active shooter and survival training to multi-hazard planning for schools, tornado shelter assessment and more. Chris Klein, environmental health & safety coordinator at MNTC, has worked closely with McConnell, focusing on emergency planning. In addition to maintaining the emergency plan for MNTC, Klein has participated in McConnell’s training sessions and has worked with school districts to develop individualized emergency plans. MNTC is involved in the Safe School 101 training initiative spearheaded by the Oklahoma Department of Emergency Management with the support of FEMA and also works closely with the Oklahoma School Security Institute. For more information about the emergency training programs available through MNTC, call (405) 364-5763 x7208 or email chris.klein@mntc.edu.